Singapore is one of Asia’s hit-list destinations and one of the world’s most luxurious cities. Go forward in time in this futuristic city with its ultra-modern architecture and skyline. Combine the action-packed city break with the tropical paradise of Bali, which is just a two and a half hour flight away, home to the most stunning landscapes, sacred temples and rich culture. Bali’s low-key neighbour is Lombok, where you will see authentic Indonesian villages, stunning waterfalls and breathtaking rice terraces. Many of the best things to see and do centre around the ultra-modern Marina Bay. Gardens By The Bay is the space-age botanical garden featuring surreal Supertree Grove, whimsical structures and futuristic bio-domes. Be wowed by Supertree Grove as the Garden Rhapsody light and sound show takes over the skyline. Head to the rooftop observation deck at the avant-garde Marina Bay Sands Casino and Hotel for a breathtaking visual experience of the Singapore skyline. Meet the Mythical Merlion, Singapore’s national icon. Spouting water from its mouth, the half fish, half lion structure is a must-see. Shop until you drop at one of the world’s best shopping areas, Orchard Road, where shops generally stay open until 10pm. Visit the Buddha Tooth Relic Temple that was built in 2007, but tells the story of centuries of history and Buddhism. For unique crafts and locally produced goods, the markets at Clarke Quay are the best option. Clarke Quay also has some of the best restaurants and street food and vibrant nightlife. Local favourites include Char Kway Teow (fried noodles) and chilli crab. In comparison with much of Asia, Singapore’s Chinatown is home to some good gay venues including Tantric Bar, May Wong’s Cafe and Taboo Club. Whilst Singapore’s LGBT laws can be less than friendly, the gay scene is undoubtedly lively. Sentosa is the popular man-made island resort connected to the city by cable car, road, monorail and pedestrian boardwalk. The many attractions on offer include the world-famous Universal Studios theme park and Tiger Sky Tower, with views stretching as far as Indonesia. Alternatively, escape the hustle and bustle and relax on some of Singapore’s best beaches, all found on Sentosa island. Fly from Singapore to Bali in two and a half hours. Arrive in Denpasar where you’ll be met by your private driver who will take you to Ubud, the island’s artistic and cultural hub, where you can meander around at your leisure. Visit Peliaton Palace and the ARMA museum for traditional Balinese architecture, art and culture. For an authentic taste of Balinese life, look around Ubud market before meeting the mischievous inhabitants of Ubud’s sacred Monkey Forest. Venture into the beautiful rice terraces on a 1-hour trek along palm tree-lined paths. At the nature lovers’ spot of Petulu, witness the thousands of herons who roost late afternoon each day. Watch a traditional dance performance and taste Balinese specialities for the perfect end to today’s road trip. En route to the active volcano Mount Batur there are several interesting stops. The tremendous 11th century temple featuring shrines carved into the cliff face, known as Gunung Kawi, will be one of the first discoveries of the day. The next temple is Tirta Empul, famous for its sacred spring water and is where the locals come for ritual cleansing. See the most spectacular views of Mount Batur and Batur Lake from the quaint village of Kintamani. After a bite to eat, discover the traditional village of Penglipuran, best known for its Balinese architecture and Kehen Temple, also known as ‘Mini Besakih’. Kick start your day at the royal Taman Ayun Temple in Mengwi and admire the tranquil ponds and traditional Balinese architecture. Next, see the Ulun Danu Temple on Lake Bratan. This temple gives the illusion of ‘floating’ on the water but is actually sitting peacefully on small islands, making this one of the most iconic temples in Bali. Next, trek through the rice fields of UNESCO-listed Jatiluwih, known as the ‘Rice Granary of Bali’ and marvel at the spectacular views. For the perfect end to your day, watch the sunset at Tanah Lot temple which is perched on a small island just off from the beach. Go back in time at Kerta Gosa, the ancient justice court located on the east side of the island. Next, go to the temple of Besakih, Bali’s ‘Mother Temple’. 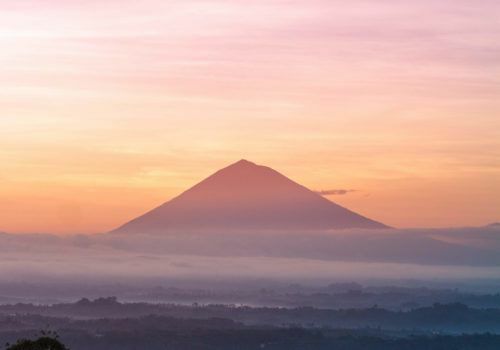 Located on the recently erupted Mount Agung, Bali’s highest volcano (3,031m), this is the largest and most religiously significant temple. 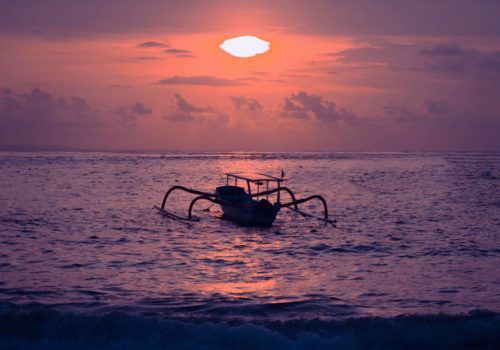 For the last destination on your trip, venture to Bali’s neighboring island, Lombok. How to get from Bali to Lombok? You can fly from Bali to Lombok in 30 minutes or take the ferry which takes approximately two hours. Spend your day at leisure relaxing on Senggigi Beach. Kickstart today’s trek with a cup of coffee (or two) made with traditionally roasted beans in the area of Tetebatu in Rinjani National Park. Have an authentic insight into rural life as you witness locals farming in the many rice fields, plantations and fruit gardens. There’s also the possibility you will see primates jump from tree to tree in one of the remote monkey forests. Enjoy a locally prepared lunch in the village of Tetebatu and marvel at the Tibu Topat waterfall. Take the opportunity to try weaving bamboo thread and learn about producing iconic clay roof tiles as you meet local families and immerse yourself in traditional Balinese culture. As your adventure draws to a close, make your way to Lombok airport for your onward flight.